The bodies seem extremely tense, as if they were trying to oppose themselves against the recurring, seizure-like limb twitching caused by an invisible electrical energy. Something seems to be pressing out of her torso, trying to emerge like a still unrecognizable figure. But the upper body and the hips are still holding up, the hybrid beings on the floor seem to be connected as if held together by brackets and hinges, yet it does not come to the final burst. Instead, the couplings of organism and machine are beginning to better control the flows of energy, they now drive out expansively in parallel and in surprisingly different formations that remind us of structures of flora and fauna, tribal dances and rites, and evoking a hypnotic fascination one can not escape. VIS MOTRIX is already the second production which has been developed in several stages over the course of months as a part of the company’s "triennale", 3-year residence in the Swiss canton of Valais. Like MOMENTUM, which was initially inspired by an exchange with the non-academic movement patterns of Parkour, VIS MOTRIX started out with a workshop and subsequently independent research on the (male-dominated) techniques of breaking and krumping, and modifying and transforming these street dance styles with regards to hybrid and post-human energies and impulses. "... these bodies here seem like aliens. Alien in the form, alien in the movement, alien in the outfit. They seem to come from another world. Not human, not animal, not machine - and yet something of everything: hybrid beings as they display through their movements. (...) In the last part of the piece, the lighting design gives the female dancers their faces back, they become more human. The floor is no longer their only element. (...) In this VIS MOTRIX part, arms and legs not only now shoot aggressively upwards, but the dancers also slam their legs loudly on the floor. Finally, one would almost like to say with relief, finally. 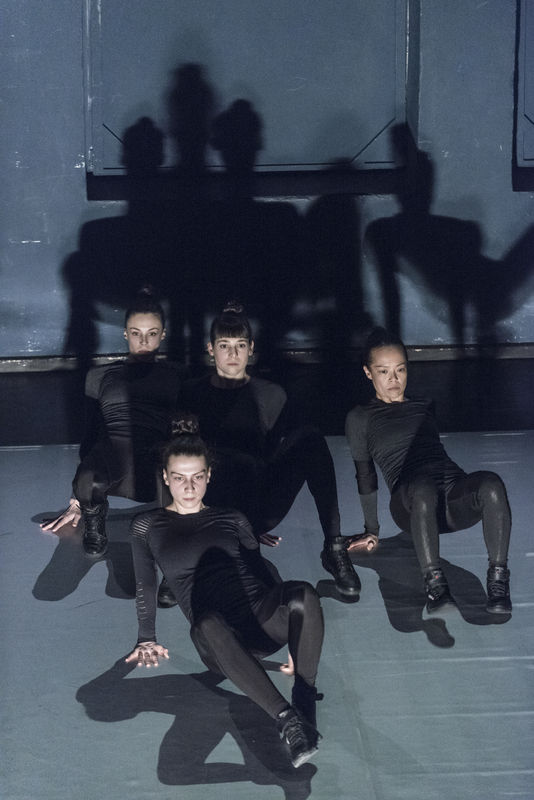 The dancers, Fa-Hsuan Chen, Martina de Dominicis, Tanja Marin Friđjónsdóttir and Susanne Schneider, are above all the ones who are strengthening the hybrid choreography by Rafaële Giovanola - oscillating between human and animal - through their strong presence." 'Vis motrix', which stands for moving force, is, from the outset of its entire concept, directed towards a higher level of abstraction. It is notable that certain movement patterns of breakdance and its more aggressive variation Krumping are reflected in the movements - already the first twitching of the chest apparently derives from it. 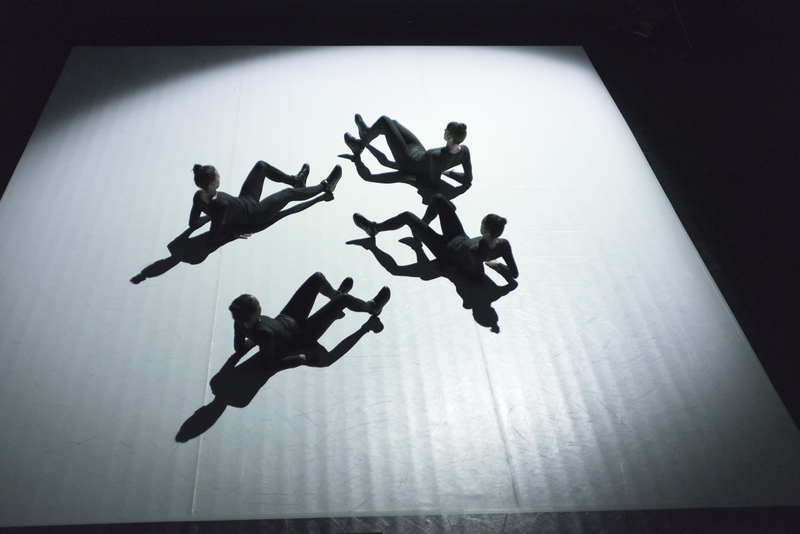 However, in the piece at the Ballsaal Theatre CocoonDance choreographer Rafaële Giovanola is just using these models to create something completely new. Until the end, the female performers stay in a position with their backs turned to the floor and their faces looking up to the ceiling. Over the course of the piece, as the movements become stronger and the pulse of Franco Mento's music intensifies, they are never really able to leave that position. As hard as they try to get off the floor, standing up or jumping up on all fours, they always seem to be tied down to the ground by an invisible band. 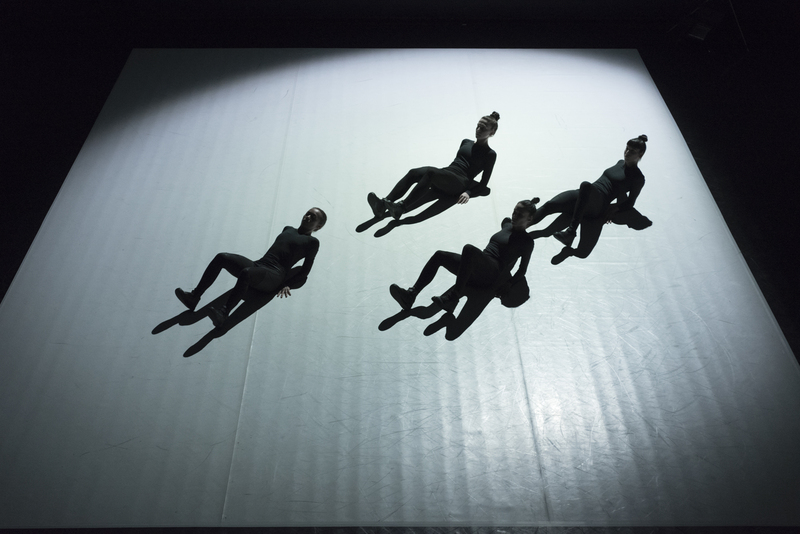 "Fa-Hsuan Chen, Martina De Dominicis, Tanja Marin Friðjónsdóttir and Susanne Schneider are doing this kind of dance very intensively, to sheer perfection, fluently and with an admirable sense of timing!" "Pure movement can not be visualized, but we can sense its magic as well as its mechanical effect inside every living being. 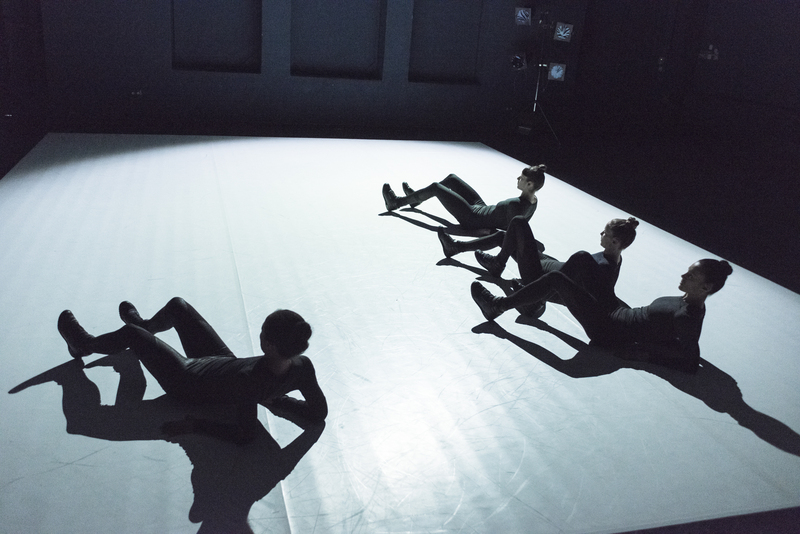 At first, Fa-Hsuan Chen, Martina de Dominicis, Susanne Schneider and Marie Viennot are lying on the sprung floor in the Orangery at the Volksgarten; then they lift their arms behind their backs and move on hands and feet in a horizontal position. Raphaele Giovanola offers her audience a view of the female body never seen before. Just for this visual stroke of genius the production deserves attention. Only briefly, towards the end, the black figures rise up. Beforehand, we only experience them as amphibians, gracefully moving and so refined in timing that, time and again, their repetitions surprise with their elegance and subtle humor. 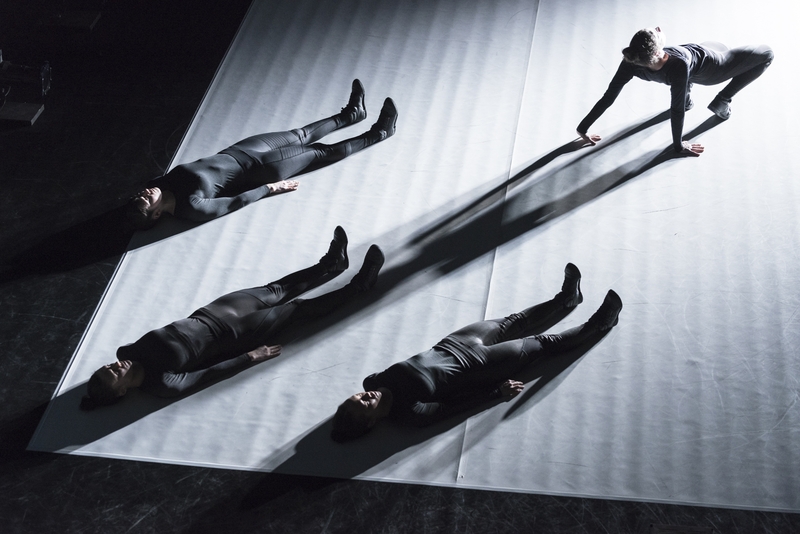 "In VIS MOTRIX, which is so to say a female counterpart to MOMENTUM, CocoonDance choreographer Rafaële Giovanola challenges her dancers to a maximum physical performance. Vis means power in Latin. Motrix is the grammatically feminine form of engine. ... Mysterious hybrid beings who move strangely; alien, but by no means threatening. Their movements are not as archaically wild as in the male predecessor production and less aggressive than Krumping, but more abstract, elegant and graceful, though not less powerful.